There are lots of practical data problems you are likely to come across when implementing KPIs and measures. I’ve identified five of the most common ones. The first of this series is ‘Stranded data’ or data living in small pools throughout your organisation. This issue is fairly simple to spot but probably the toughest of challenges to resolve. Develop a clear definition of which unique KPIs you need to collect. Create a production process map for the measure. This process should quickly flush out any ambiguity over where the data comes from and concerns over its accuracy. The beauty of this approach is it involves talking to almost everyone in the data supply chain, so you find out lots of really useful incidental information. 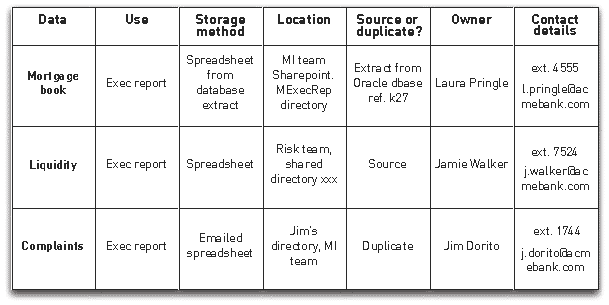 Create a simple table like the example below, showing the data grouped by where it is stored. Is this the right place to store this information? Is the method by which this information is collected clearly defined and effective? Is there a better method for moving that information from the storage point to the point of use, in a hassle-free and reliable way? A simple data source tracker template is available on the Downloads for KPI Checklists Book page.